London landmarks turned pink on Saturday night to mark the birth of the new royal princess. Kate Middleton and Prince William’s second child, who is fourth in line to the throne, was delivered at 08:34 BST on May 2nd at St Mary’s Hospital in London, and weighed 8lbs 3oz (3.7kg). 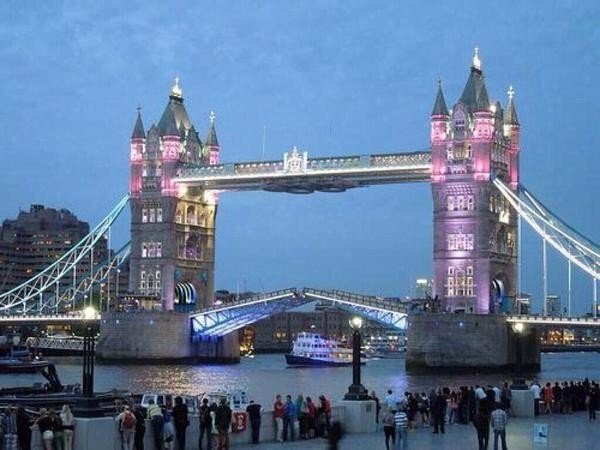 Tower Bridge was among several London landmarks lit up in pink in the new princess’ honor. Trafalgar Square’s fountains and the London Eye were also illuminated on Saturday night to mark the birth. On May4th, the princess’s birth will be marked by gun salutes in Hyde Park and the Tower of London. Soldiers from The King’s Troop Royal Horse Artillery will ride out in procession from Wellington Barracks, near Buckingham Palace to sound 41 shots in the park at 14:00 BST. A 62 Gun Salute by the Honourable Artillery Company will take place at the Tower of London at the same time.